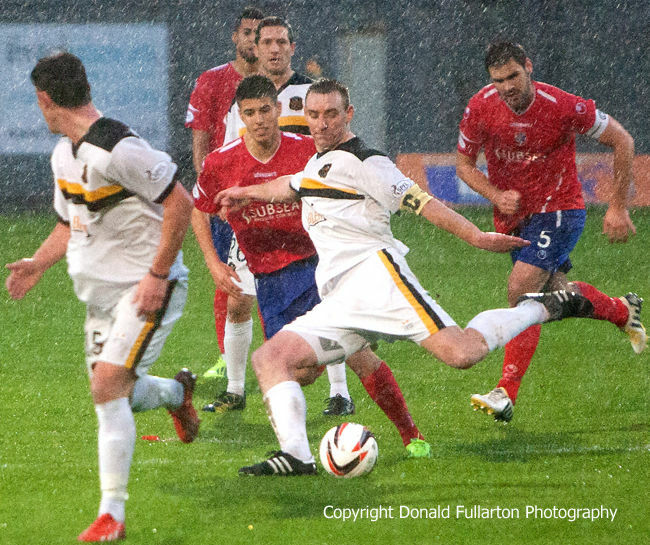 DUMBARTON won through to the fourth round of the William Hill Scottish Cup with a well-earned victory over Cowdenbeath in drenching rain at the Bet Butler Stadium. Manager Ian Murray was back in the dugout after his three match suspension, and saw his men battle bravely in a torrential downpour as they faced Colin Cameron's Blue Brazil for the second successive week. Midfielder Jordan Kirkpatrick was the Sons hero, opening the scoring with a crisp shot early in the first half and netting the winner late in the second half. He was unlucky not to grab a hat-trick when a long range shot rebounded from the bar with keeper Flynn well beaten. A Jamie Stevenson goal early in the second period gave the visitors hope, but when ref Ian Brines blew the final whistle it was a well deserved victory for the battling home side. The picture shows Sons skipper Andy Graham trying a shot.